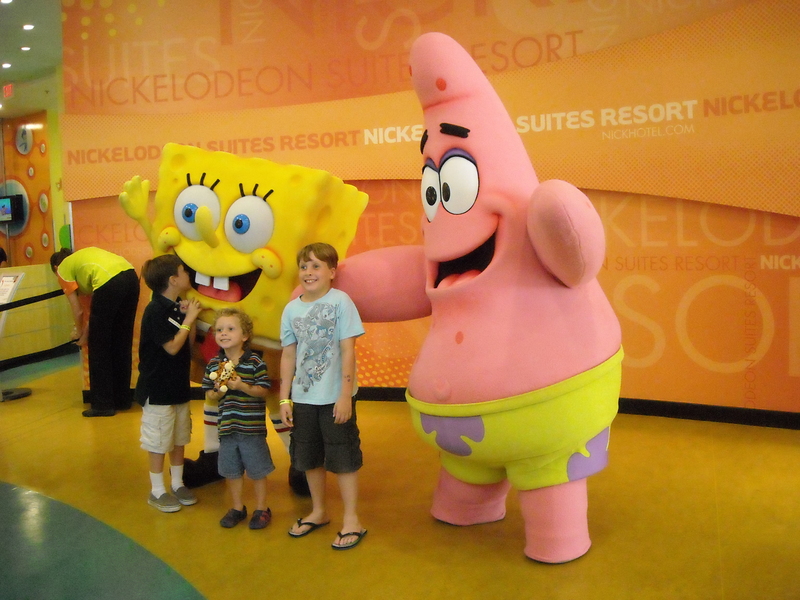 Over the weekend we celebrated our eight year old grandson’s birthday with a road trip to Nickelodeon Resorts & Suites. The Friday afternoon traffic through Orlando on I-4 reminded us why we choose not to go out that way unless we really have to. Bumper to bumper for no apparent reason, it always amazes me how traffic crawls on four lanes with no wrecks at which to gawk and no rain to cause a backup. Check-in was seamless with the announcement of Carter’s birthday over a bull horn, which was much appreciated by the shy birthday boy. We booked through Travelocity with a room rate of $134. Add to that a “resort fee” of $30 per night and you can do the math. I have always thought the extra cost to be like a car lot with the “dealer fee” added. Just give us the total amount to rent the room, with no surprise fees tacked on. Charging extra kind of insults one’s intelligence. Another pet peeve, usually with more expensive hotels, is the lack of WiFi in the rooms. This place didn’t even offer it with an added fee, only available in the common areas. However, the rooms are supposed to be equipped with a hard-wire to connect a laptop to the internet. Not so in our room, though, and when I went downstairs to secure the missing wire I was told that our particular room was not able to get the internet via DSL and they insisted on moving us to another room. Several hours later we were in a new room with the aforementioned cord plugged into the wall. All of this hoopla was for naught, however, when we realized our laptop and net book weren’t configured for their method of accessing the internet anyway. Much ado about nothing just to stay connected to cyberspace. Actually, it was nice to take a break from email and FaceBook for the weekend. The two-bedroom unit was very comfortable with a separate bedroom for gma and gpa, another room with twin beds for the older boys, and a foldout sofa in the living room for mom and Isaiah. The kitchenette included a tiny fridge, microwave and sink, which gave us the option to store our own drinks and snacks. 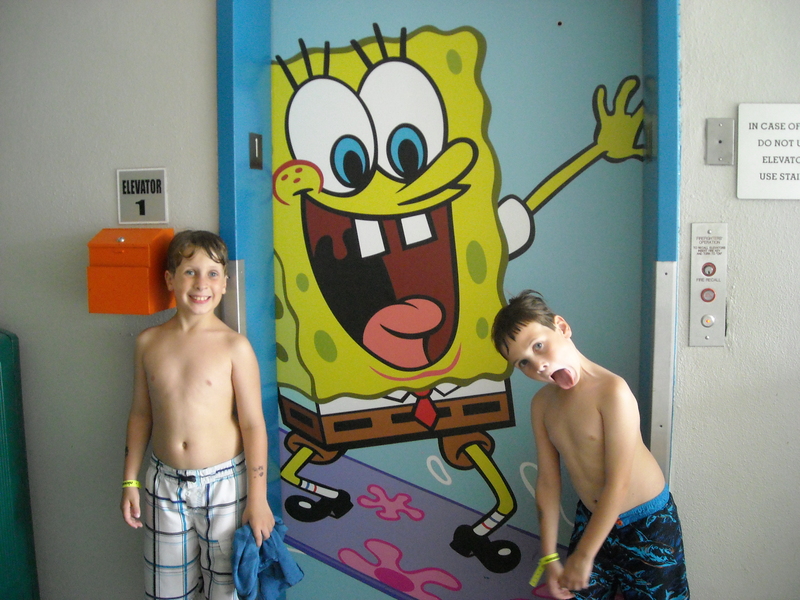 Since the resort is for kids, we didn’t worry about the boys getting noisy, and we weren’t bothered by anyone else in the building. The beds were comfy and we slept well. The food court “mall” offers a couple of buffet restaurants, a Subway, pizza place, a cafe that sells Starbucks coffee along with bagels, donuts, breakfast sandwiches, etc. Pricewise, this was the best choice for breakfast as the buffet is expensive and the character breakfast is extremely pricey. Get to the mall early to avoid lines of grumpy, bleary-eyed parents scrambling for their caffeine fix. 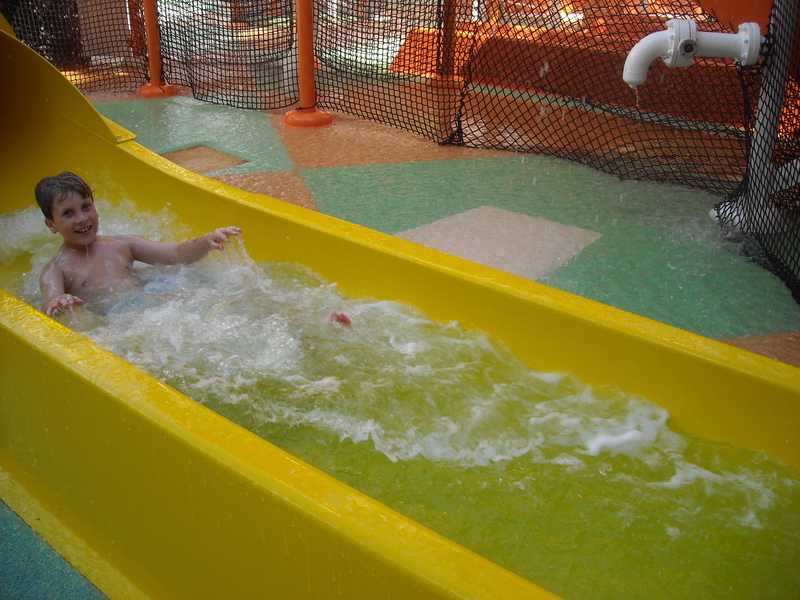 The heated pools are made for kids – a huge lagoon with slides, kiddie areas, and daily sliming was a big hit. A smaller pool, near our room, proved popular with our guys as it came with a calmer atmosphere and a separate area for the little ones. The security situation around the pools was stellar; always a presence of at least four, very vigilant, lifeguards. We witnessed one female lifeguard standing in the shallow area scanning the water very methodically, every quadrant of the section to which she was assigned. Shift changes occurred regularly, so they wouldn’t get passive in a situation with so many kids in and out of the pool. It seems impossible to stay on top of everyone, but they did a great job, even rescuing one little guy who went under, with no parent nearby. The lifeguards jumped right in and pulled him out while the mom nonchalantly took him, with no sense of urgency or thanks to the young people who saved him from drowning. We went away with the secure feeling that if one of our kids was out of our sight for a second, they were being watched by professionals. Of course there is no accounting for parents behaving badly. We saw several dads, over the course of the weekend, imbibing heavily, and witnessed one being demanding of staff but not making any sense in his drunken state. The staff, in turn, was very polite and just kept smiling and trying to help. Kudos to the staff over the entire weekend…they were very professional and always with a smile. One of the free perks was a shuttle bus to Disney, so Saturday night we rode to the Magic Kingdom where we caught the monorail to the Polynesian Hotel and enjoyed an inexpensive dinner at Capt. Cooks, then headed out to the lakefront where Peter Pan was being shown on a big screen. At 8 p.m. the fireworks started which were enjoyed by all, especially the big kids, while sipping a fruity glass of sangria. 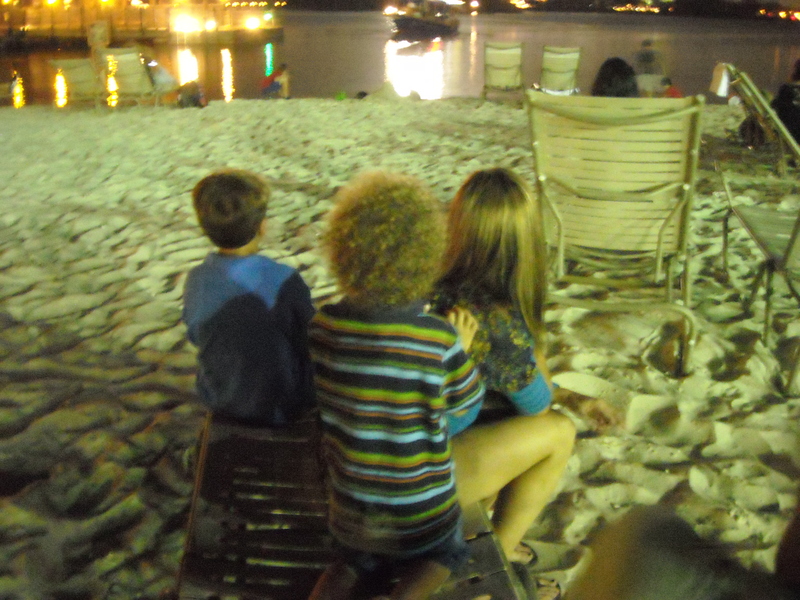 The boys had a great time; the weather was perfect, sitting on the beach with a full moon felt so relaxing after a frenetic day with three wild and crazy kids. We then took a boat to the Magic Kingdom where we caught the riverboat to the transportation center, and then the shuttle back to the hotel. Taking advantage of free stuff at Disney is always a favorite. 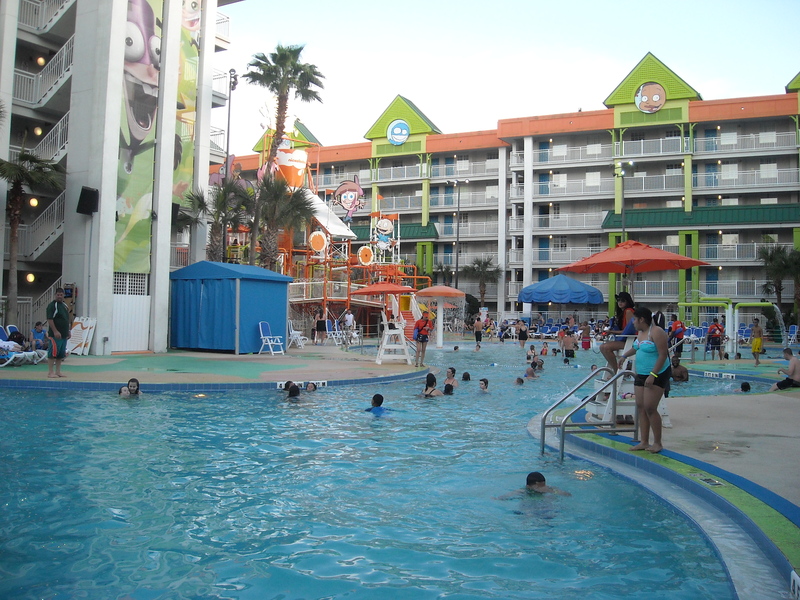 Nobody does it like Disney, however, so do not expect that kind of experience at Nickelodeon. However, if I were the eight year old child celebrating a birthday, I wouldn’t complain about a thing. The bottom line is that the kids were thrilled and that’s why we were there. 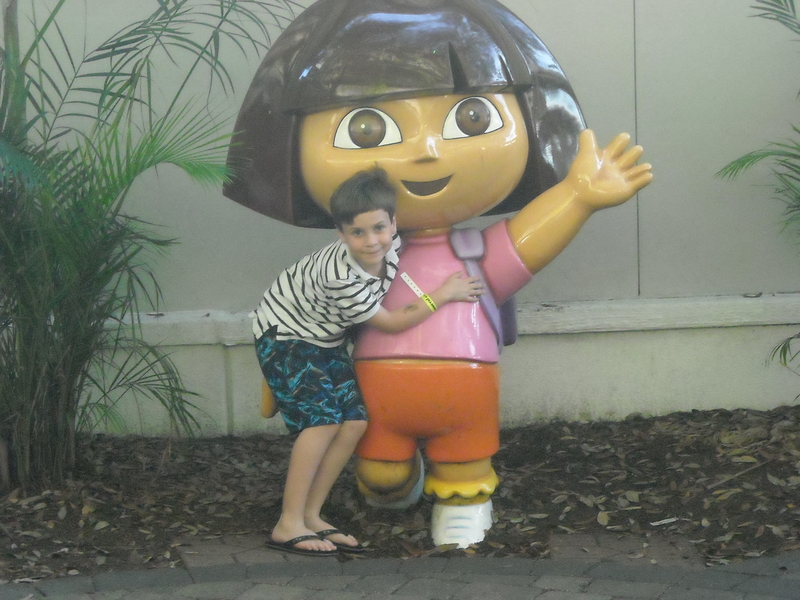 This entry was posted in Uncategorized and tagged birthday, Disney, Dora, holiday, kids, monorail, Nick, Nickelodeon, Orlando, Polynesian, Spongebob, Starbucks, travel, vacation, wifi. Bookmark the permalink. Sounds like a wonderful family weekend! Nice to hear that the lifeguards were doing a good job. They were phenomenal, not to mention having the courage to jump into a heated pool with a gazillion kids of all ages -I’m sure there was more than one reason why that pool was warm! I couldn’t bring myself to get into it.